60 second sound works and 60 second videos are being sought from composers and artists living and/or working in New England, USA: CT, RI, MA, NH, VT & ME. live event/exhibit: 60 sound pieces and 60 videos will be selected and intentionally paired based on the curators’ responses to both media. These 60 sound & video pieces are intended for presentation or installation in a wide variety of venues. web installation: a web site (currently under development) will be constructed using these same 60 sound and video pieces. The web interface will allow visitors to randomly pair sound pieces and videos to create a wide array of juxtapositions and experiences of this collection of sound and image. Additionally, visitors will have the choice to hear/view selected works independently with links to producers. The web site is also intended for kiosk installation in unexpected locations. We are currently making arrangements for showings and installations throughout New England. content: there are no stylistic preferences. we want to encourage submission of electronic music of all genres, sound or noise pieces, field recordings, deconstructions, reconstructions, text works, spoken word, combinations of all of the above etc. and new works produced specifically for this project. duration: submitted works must be 60 seconds or less - works that are under 60 seconds should be surrounded by silence - on either or both the beginning and end - so that the total duration is exactly 60 seconds. duration: submitted works must be 60 seconds or less of silent video: no titles or credits. (However, works can contain text-on-screen as part of it's content.) Works that are under 60 seconds should be surrounded by black/white etc. - on either or both the beginning and end - so that the total duration is exactly 60 seconds. URL for download (and other file requested below). application form - [3 sentence bios will be solicited from selected composers via email]. video : Full frame Quicktime file submitted on CD-R or DVD-R, with credits + 3 sentence bio as text file (3 sentences only) + web address, email or other contact info. an email with URL for Quicktime download, credits + 3 sentence bio as text file (3 sentences only) + web address, email or other preferred contact info. 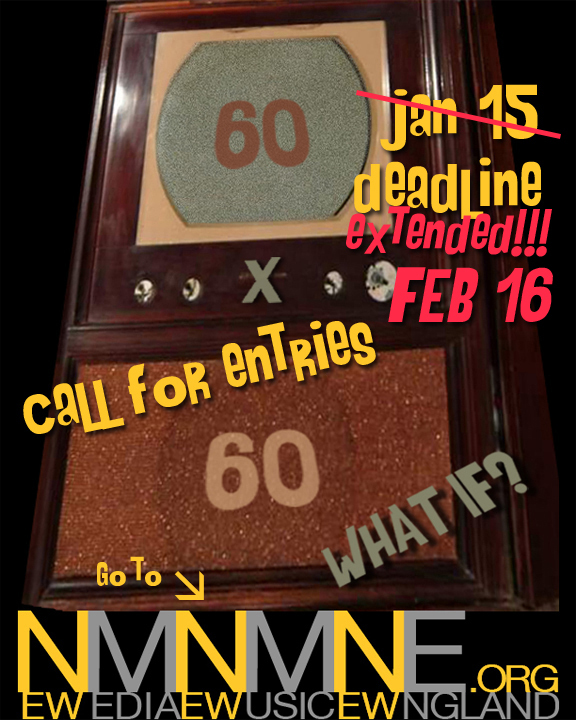 60 second sound works and 60 second videos are being sought from composers and artists living and/or working in New England, USA: CT, RI, MA, NH, VT & ME - ONLY. more than one submission is acceptable. submitted materials will not be returned and will be discarded after project completion. we are not accepting program notes or artist statements. 200 Bloomfield Ave. 200 Bloomfield Ave.